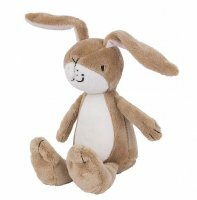 Tiny Sylvain Rabbit is a super soft and super cute first soft toy. Sylvain the rabbit has a pale brown plush body and is wearing a pair of stripey dungarees with which you can dress and undress him. He measures 20cm from ear to paw. Machine washable and suitable from birth onwards. Moulin Roty has been producing iconic French toys for over 40 years and they are renowned for their superb quality and design.